You are late bus! I am walking! 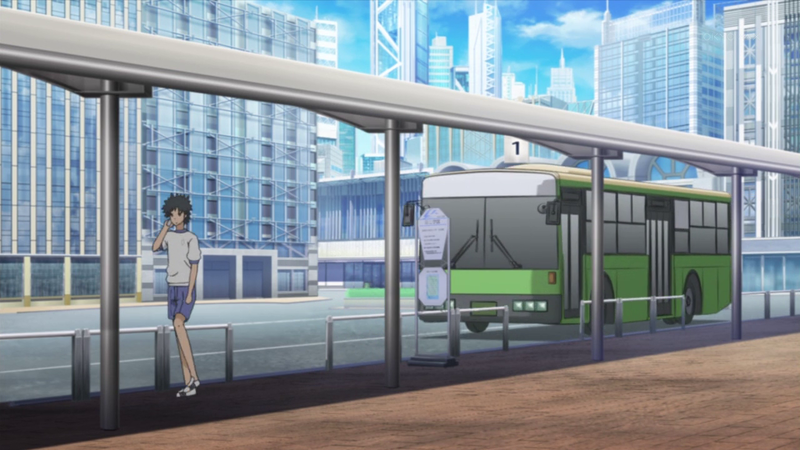 Touma continues his chase after Oriana, but loses her at a bus top. He phones Motoharu and tells him that he has lost her. He tells Motoharu that her possible destination is around the 7th District, when he realises that Oriana wandering the city, increases her chance of getting caught. He then pieces together that she is waiting for certain conditions to be met before the Croce di Pietro’s activation. Touma sends information to Motoharu that he received from Stiyl. Motoharu tells Touma that it is a report from the British Museum that they were cleaning up the vault that contained the Croce di Pietro and kept it from being exposed to direct sunlight. They then solve that the owner used astrology, therefore the Croce di Pietro’s activation would be by the stars. However, Motoharu adds there is a flaw to their theory is that, Saint Peter died on June 29th, and the latitudes and longitudes of Japan and Rome are different. He tells him that he has no trust in their current theory, but still gives a deadline of sunset to retrieve the Croce di Pietro. Just then, Touma is interrupted by the arrival of Index who asks him what he is doing. Meanwhile, Oriana gets off the bus and figures that Kaori is not coming. She calls on Lidvia, who tells her that she has injured another civilian; Aisa and adds that her cross was to protect her powers but has no attack power what so ever. Lidvia then tells Oriana to focus on the task at hand by hopefully freeing Academy City. Back with Touma, Index wonders why Touma has not participated in any events lately. He tells her that he has been involved with administrative jobs, he tells Index to go back to the events and he would join her as soon as he can. She agrees and heads off; Touma returns to his call with Motoharu and opts to resolve the current situation quickly. Touma is in the shopping precinct waiting and he hears Last Orders voice. Just then his phone rings; it is Stiyl who has finished healing Aisa and now has left her to the doctors to help her. Stiyl is then suddenly hugged by Komoe, who thanks him for saving Aisa and she starts crying, he tells Touma to contact Motoharu, once he has ditched Komoe, he would join them. Look out she is behind you!!! Later, Seiri is out of hospital and is contacted by Komoe who tells her that Aisa had been injured. Seiri believes it was Touma and Motoharu who caused it, however Komoe tells her that it was someone else and that it would have been worse if it wasn’t for Touma and the others. 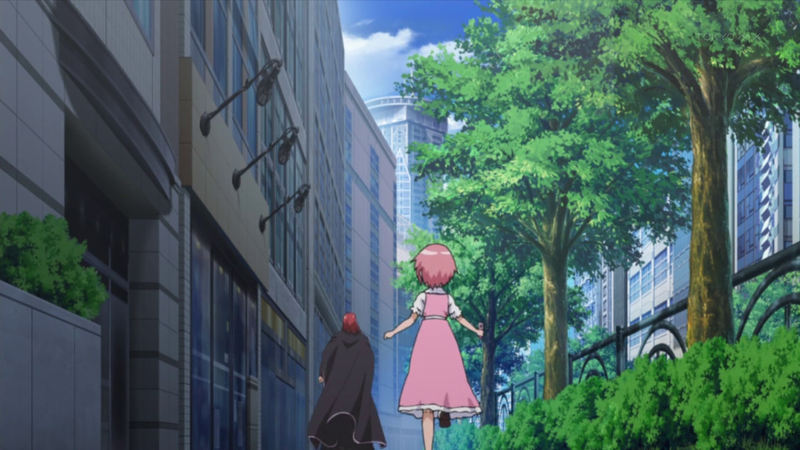 Suddenly Stiyl runs past Komoe and she chases after him hanging up on Seiri, who wonders what is going on in Academy City. Motoharu has met up with Touma and explains that the certain situation lies within the constellations. Motoharu then gets a phone call from Orsola; who is actually looking for Stiyl, tells them that she has finally understood how the Croce di Pietro is activated; the Croce is to be reliant on constellations, however the location or the season does not matter. Also the location must be understood well and a choice is to be done on which of the 88 constellations are the most relevant for use. Touma then asks about the date of Saint Peter’s death. Orsola explains that 29th June might only be a coincidence to the date when the Croce is used in the Vatican. Touma then asks about the relevance of 19th September in the activation of Croce on its location; Orsola tells them that she has figured out the location. Meanwhile, Mikoto is out shopping with her mother, who is looking at childish things. Mikoto then feels a presence behind and looks to see Kuroko staring at her. Kuroko looks towards Misuzu and is overwhelmed by her aura, which makes her want them both. 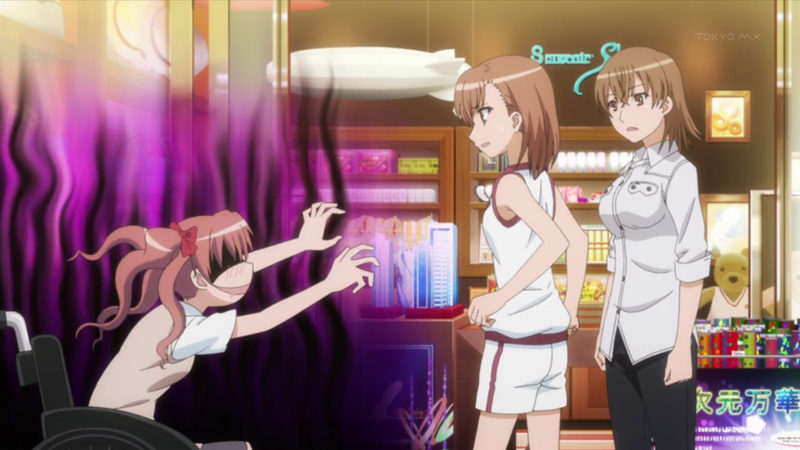 Misuzu thinks that Mikoto is interested in girls, which she strongly denies and grabs Kuroko. Mikoto shakes her to snap out of it, while Misuzu looks through the window down to the plaza and sees Touma. Touma is talking with Motoharu and they figure out that the only place that the Croce di Pietro can be activated; is a place where there is no obstruction of view towards the stars. Touma reveals that the location is an experimental airport in the 23rd district. 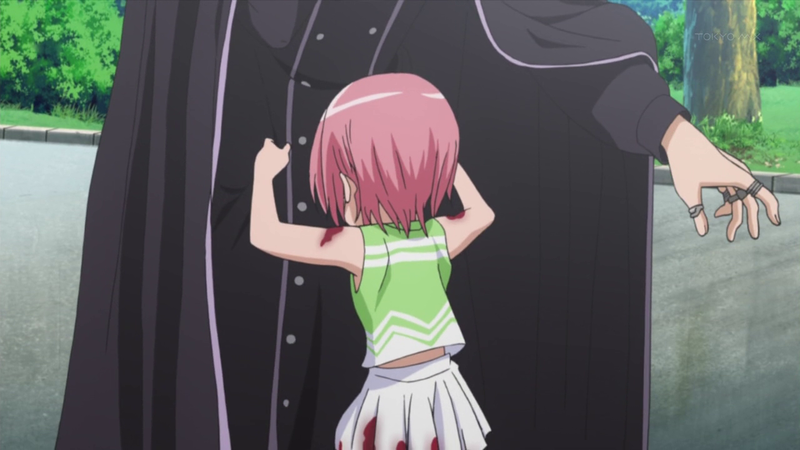 Just then, Stiyl joins them and complains about Komoe following him; even after using disperse magic on her, she left its effective range and still came after him. Touma wonders about the plan as the airport is guarded, Motoharu tells him that he would use his special privilege for only this occasion. Oriana contacts Lidvia, reporting about her current status. She discovers that security has been tightened and the time for preparations are getting close. However, Oriana is confident that the ideal location is within her reach. Motoharu ordered the security in District 23 to be altered, which caused Oriana to worry slightly. Despite plans being laid out without any problems, Stiyl is concerned about Motoharu participation; in spite of his injuries. Motoharu tells him that there is no turning back. As the train to District 23 arrives, Stiyl announces that once they board the train there is no turning back from the upcoming bloodbath. Touma tells him that he will finish this once and for all and try avoiding a bloodbath. Meanwhile at sunset, Komoe apologizes to Touma’s parents for not being able to keep a close eye on Touma. However, Touma’s parents understands this and instead, asks her about Touma’s decisions. Komoe tells them that he is not forced into anything he does which is enough for Touya and Shiina to allow their son to do what he wishes. I'll lose if I had to fight her in that attire!!! Meanwhile, Lidvia emerges; carrying a massive cross on her back. As she stabs this onto the ground, she begins to chant a long incantation. 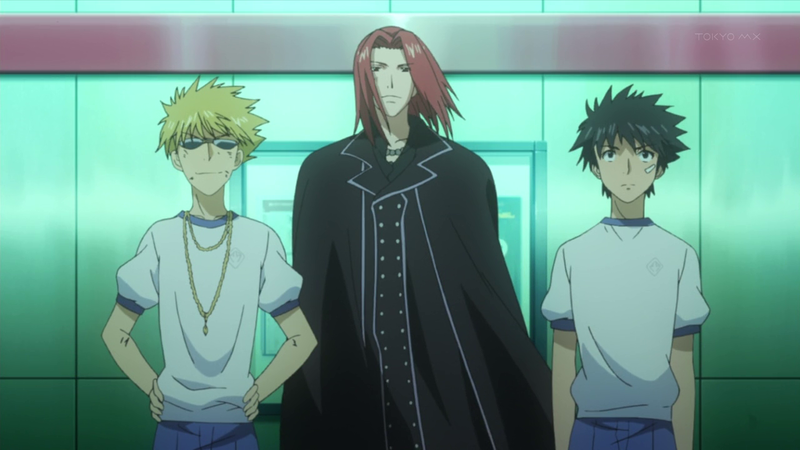 Touma, Stiyl and Motoharu are keeping a low profile as they plan on their attack near a landing strip. Motoharu plans on using blind spots, which open by the constant changing aerial routes of patrol planes as they have to avoid incoming air traffic and to proceed without attracting security. They find themselves faced with a high steel fence; Touma spots an Oriana spell page on the fence and warns Motoharu. However he is late in his warning and Motoharu gets hit by an electric wave, incapacitating him. Soon Oriana appears on the other side, awaiting their next move. Touma and Stiyl continue leaving behind Motoharu and dispels the magic in the fence before climbing over it. 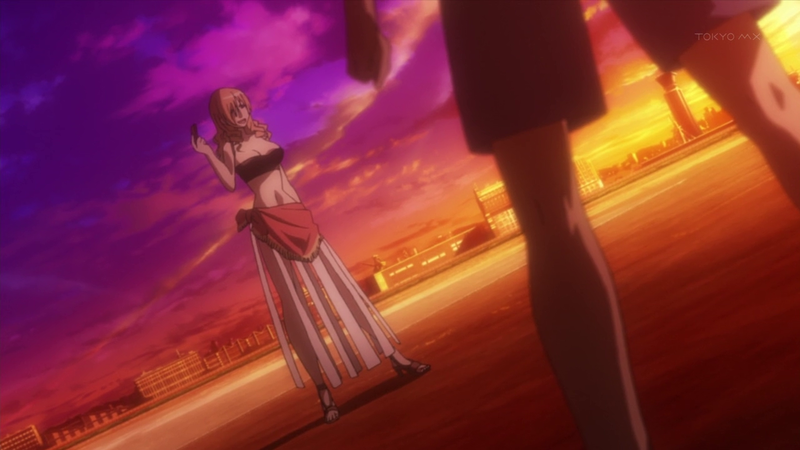 As they reach the other side, Stiyl and Touma fend off Oriana’s attacks. She proves superior even to the combined efforts of the two, managing to disable Stiyl and Touma with a mixture of fighting skill and magic. With Stiyl down, Touma manages to get up and rejects Oriana’s ideas of making a world of happiness by destroying the barrier between science and magic. Touma then declares that he will destroy her illusion even if it would cause the disruption of the Daihasei Festival. An exciting one this arc, although it was filled with unnecessary injuries to innocent civilians (Aisa and Seiri). To my relief that this series is still going, so we are now halfway and another 12 episodes to go (24 episodes total, hopefully). So exciting!!! Also I like to add that I am sorry that I wasn’t able to catch up in time for the end of Ore No Imouto and MM!, but they will be complete in time before the next season of anime and I will let you know what anime blogs I am doing.